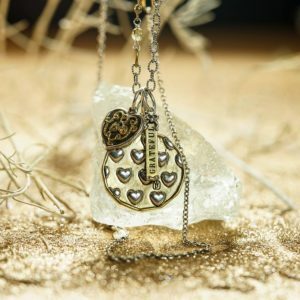 All Waxing Poetic jewelry is 50% off through the end of May. Stop by the store and check out our variety of these beautiful jewelry pieces. Since 2001, Waxing Poetic has been creating unique jewelry that focuses on human touch and craftsmanship. They smolder brass pieces onto silver, or silver onto brass, that requires a high skill-set that many other companies don’t do. Waxing Poetic believes strongly in sustainability and protecting the environment. They strive to use recycled silver in up to 50% of the material they produce in an effort to lessen the impact of mining. They are consistently recycling wax and plaster which are then later used by ceramic artists. The care for their craftspeople and the environment is at the heart of Waxing Poetic. This entry was posted on Monday, April 16th, 2018 at 3:37 pm	and is filed under News & Updates, specials. You can follow any responses to this entry through the RSS 2.0 feed. Both comments and pings are currently closed.